Ok I’ll be honest – sometimes I feel like I’d be lost without cool survival food hacks like these. 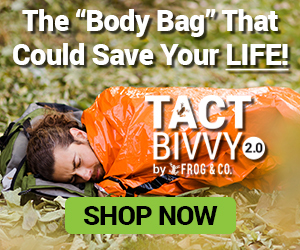 I mean, don’t get me wrong – there’s definitely a time and a place to bring your fancy survival cooking equipment and camp/bug out in style. However, there are many times when I think it’s even more fun to just be innovative with my survival cooking and use as little resources as possible. Plus, this way, there’s no pots and pans to deal with or dishes to clean up! Call me a man of simple tastes, but I prefer to use as few survival supplies as possible. Plus, if I get in an emergency, I know I can depend on these survival food hacks if I run out of supplies or need to save them. 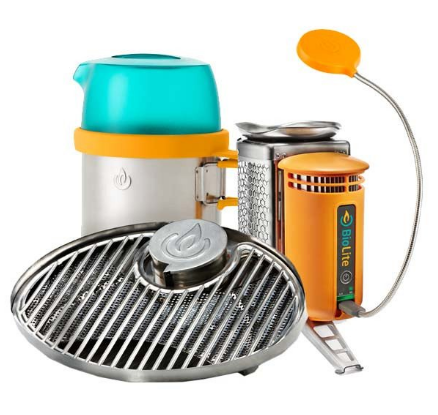 Don’t want to bring the heavy cookware along to cook your breakfast? You can use a normal potato as a skillet to cook your eggs in the morning! Amazing! Note: If you’d rather just stick to the cookware (don’t worry, we won’t judge you), we’ve got a great hard anodized aluminum cookset you’re sure to love. It’s 7 lbs. 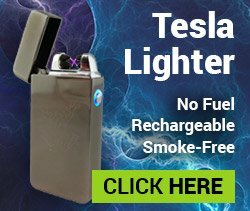 lighter and 2 times stronger than our stainless steel cookset! See it here. See this cool video to see how to cook an egg in a potato. It’s surprisingly easy! Believe it or not, Doritos make mighty fine kindling, especially when you don’t have any tinder (or when all your tinder is wet!). Note: We believe that rain is no excuse for your tinder to stop working in a survival situation. 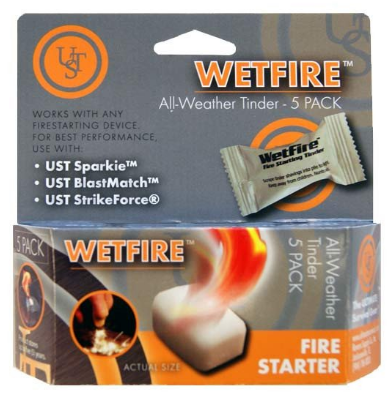 Grab some WetFire Tinder today and ignite a raging fire in the pouring rain every single time. If you’re heading out on a long trip, you’ll probably need coffee or tea to keep you awake and focused. A great way to save space in your bug out bag is to nix the box or bag the coffee/tea came in, and instead pour the coffee grounds or tea leaves into a coffee filter. Once you have enough in the filter for one cup of coffee or tea, twist the top of the filter shut and tie it off with a piece of dental floss. Repeat as needed. Note: Think dental floss doesn’t have any other survival uses? Guess again! Read all about them here. 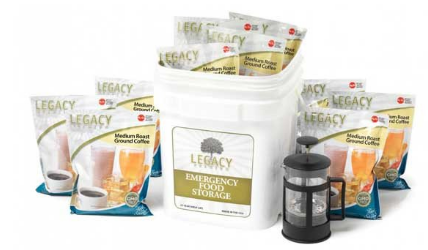 If you’re needing some tasty coffee to save for emergencies, I highly suggest the Legacy brand survival coffee bucket. It comes with 350 servings of delicious coffee PLUS a french press! 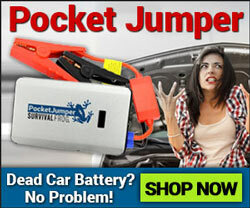 See this awesome deal here. That’s right! With just a few simple ingredients you can celebrate someone’s birthday or just have a delicious dessert by baking a cake in an orange. No pots or pans required! 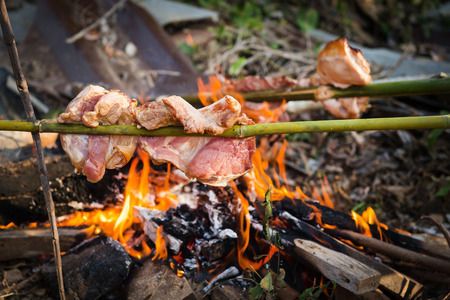 Using just four empty beer cans, some sticks and a small fire you can make your very own grill to roast hot dogs on! This is a really great hack if you want a hearty, delicious breakfast without the hassle of carrying or cleaning up your pots and pans. Using just bacon, eggs, a paper bag, and a fire you can make a delicious breakfast with minimal effort. Wasn’t that video cool?! I love that in just 15 minutes you can cook your very own bacon and eggs. We’ve actually got a really tasty option for this ourselves – our Mountain House Scrambled Eggs with Bacon. The big advantage with these delicious Mountain House food packs is there’s no assembly required. All you need to do is open the bag and remove the oxygen absorber, boil water (specific amount is listed on the bag), pour the water in the bag, stir up the food, close the bag up tightly, and let it sit for about 8-9 minutes. That’s it! After 9 minutes is up you’re free to eat some delicious scrambled eggs with bacon. And you didn’t even have to grease up a paper bag or make a fire to do it! Plus, it’s at least 5 minutes faster to cook than the paper bag trick, which feels like hours of difference when you’re starving. Another big advantage of these Mountain House foods is that you never have to worry about burning them. They come out perfect every single time. Plus, with a shelf-life of 30 years, you know they’ll be just as tasty today as they will be when SHTF. 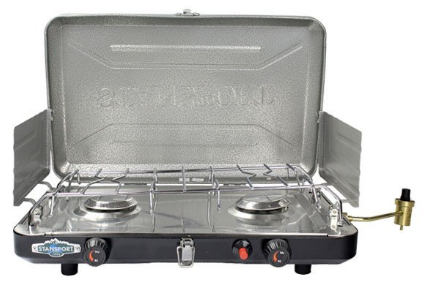 Now you might be thinking, “That’s all great but you mention boiling water to cook the food.” To make things easier, combine the Mountain House food with our super awesome, compact Vector Stove & Pot Combo! 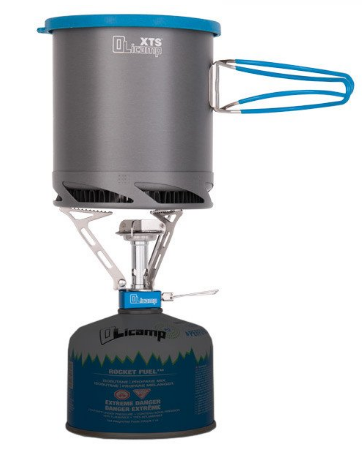 Not only does this amazing little pot boil water 40% faster than regular pots, but it also holds the compact stove inside it, making it super convenient to pack into any bug out bag or camping gear! This pot and stove combo is small enough to fit in your hand, yet powerful enough to cook your survival food quickly and thoroughly in no time at all. And, when paired with Mountain House Scrambled Eggs and Bacon, it’s an unbeatable combination. Take this awesome Mountain House food and Vector Stove/Pot Combo hiking, backpacking, camping, on picnics, and bugging out. It’s the perfect pair for outdoor cooking! 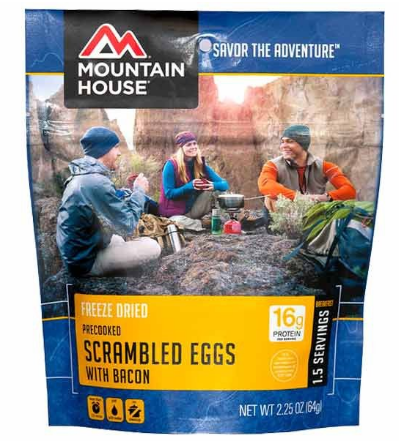 Click on the images below to grab your Vector Stove/Pot Combo as well as to stock up on Mountain House Scrambled Eggs and Bacon for your next adventure! P.S: Want even more great flavors? Click here to see our HUGE collection of Mountain House food varieties! This entry was posted in Survival Cooking, Survival Hacks, Videos and tagged best survival foods, DIY, DIY Survival, food, survival food on September 8, 2016 by Survival Frog.